I have been stalking this H&M blazer ever since I saw Chris with Chubbette Tales Life After Spanx wear it. Unfortunately, we do not have a H&M store in Austin, but one is coming this fall! HOORAY! Anyway, I jokingly told her that if she ever saw it again that she had to buy it for me. A month or so went by and last week she sent me a picture of this beauty on Twitter. My heart seriously skipped a beat when it popped up on my phone. Is she teasing me? Is she playing with my head? Did she really find it? Oh, yes she did! It was the last one and it was in my size! This blazer and I were meant to be! Utter and complete fate! So, my sweet and thoughtful Chris scooped it up and mailed it in lightning fast speed. I just received it on Monday and couldn't wait to slip it on. It was just as perfect as I imagined it - bright, light weight and doesn't hold the slightest wrinkle. I can't wait to wear it again and again! So, thank you again Chris, from the bottom of my heart! You are one of the most thoughtful and kindest friends that I have made through this whole blogging experience. I am so grateful for our friendship. One day we WILL meet in person and hit up every store known to man TOGETHER! I LOVE YOU! Now go visit her blog and see just how fabulous this lady truly is! Cheers to bloggers shopping for bloggers! 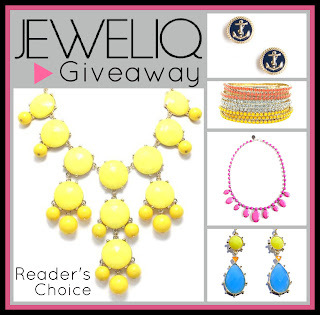 Don't forget to enter the JEWELIQ Reader's Choice Giveaway. Today I am linking up with the Pleated Poppy. Check out other outfits post here! How sweet! Blogger friends are the best! LOVE this blazer. LOVE chris. LOVE that she did this for you! i'm so jealous that you are going to have h&m near you soon. i need to write to them and tell them to come here!! Isn't Chris the sweetest?! I absolutely adore her! Wish I had an H&M near me too. Love that store! Aww, how sweet! Looks great on you! Chris is so sweet. The blazer is gorgeous on you, love the color. Aww that is awesome! It looks amazing on you and I can totally understand your excitement - what a fabulous piece! How precious is she!?!?! And how great is that blazer! I want an H&M! I love it! I have the print in top form, its such a great print! That is SO sweet that she sent you the blazer! What a wonderful blogger friend :) The print on it is so fun! I don't know how you live without H&M...so glad you're getting one soon! that is so sweet!! and I love it! and I love those shorts too! I want one!!!!! So adorable! How awesome is that! How sweet of her! It looks great! Not having an H&M when I lived in Austin saved me so much money! I'm excited y'all are finally getting one:)Love the blazer/ shorts combo! Aw how sweet! :) This looks great on you Shanna! Beautiful photos, of course! I've only been to H&M once in my entire life. I wish on a million starts we would get one even semi-close to us. I just started following both yours and Chris's blogs and I love them both. She does seem like a sweet person, as do you. So glad she could help you out, and did so! That's an awesome friend! That is SO stinkin' sweet that she sent you this blazer!! Not to mention, it's so adorable! The colors are so much fun! Blogger friends rock. That is so awesome! What a sweet friend. You look so cute in it too! Oh man...I'm so jealous! I love that blazer. It is just gorgeous. I remember seeing it on Chris and just loved, loved it. You are making me love it too! Such a cool find and how sweet that she found it! I WANT THAT BLAZER! It is so fab, I have never seen it at my H&M though! love it, looks great with the belt! Awww such a sweet blogger friend. I LOVE it too! That is so sweet she sent that to you! I love that jacket - soo cute! Awww what a great bloggy friend, that was so sweet of her! I love the shapes and colors of it, perfect for summer! That is absolutely so sweet! Cute blazer, love it on you. So adorable! I love that blazer!!!! you look so fabulous!!! I love it! That is SO sweet - love the blazer - definitely an awesome pattern and awesome colors! I love Chris! We don't have one either. And you probably give her a big hug and kiss on the lips for sending you this. How sweet! Love it! I need to make a trip to H&M soon! How about you come visit and we go together? that is SERIOUSLY awesome. what an amazing blazer and what an amazing blogger friend!! It was destiny girl!! Love the blazer on you!!! Oh and the new Essie metallics are so pretty!! Need!! That's so sweet of her! It's very cute! Oh wow! That blazer is amazing and Chris is such a sweetheart! come say hello over at nichollvincent.blogspot.com and have a great night! love love love that blazer! chris was so sweet to send it to you! can't even handle how cute you are--and how cute that blazer is! I knew it would look fantastic on you! We are twinkies with the shoes too! Remember... I will be your personal H&M shopper until one opens up near you. They had the cutest mint colored dress that would look darling on you! Just saying. Thank you for my lovely gift, friend... thank you, thank yoU! I'm obsessed with this blazer on you!!! That's so sweet of Chris to send it to you! H&M is amazing and I LOVE THAT BLAZER!!!! Love the blazer! You and Chris are both so sweet! That is the best story! Such a fabulous blazer, but even better that the kindness of a blogger friend made it possible! This is why I love what us fashion blogger do... and our little community! Okay, this outfit is pretty but more importantly you are just so gorgeous! Those UO shoes are loooove. That's so sweet! I need to find this blazer! H&M is about 1.5 hrs away, but I seriously need to make the trip if that blazer is there! Loveee it! You always find the cutest clothes and pair them together so well! Loving the pink, grey, and orange combo!